Single-level, luxury home is situated in a quiet neighborhood, and features four beautifully decorated bedrooms, two full bathrooms, a fully-equipped kitchen, formal dining room, and a private screened pool with a large deck overlooking a conservation wildlife area. Relax to a beautiful view with lots of privacy! White privacy fence on two sides for even extra privacy. 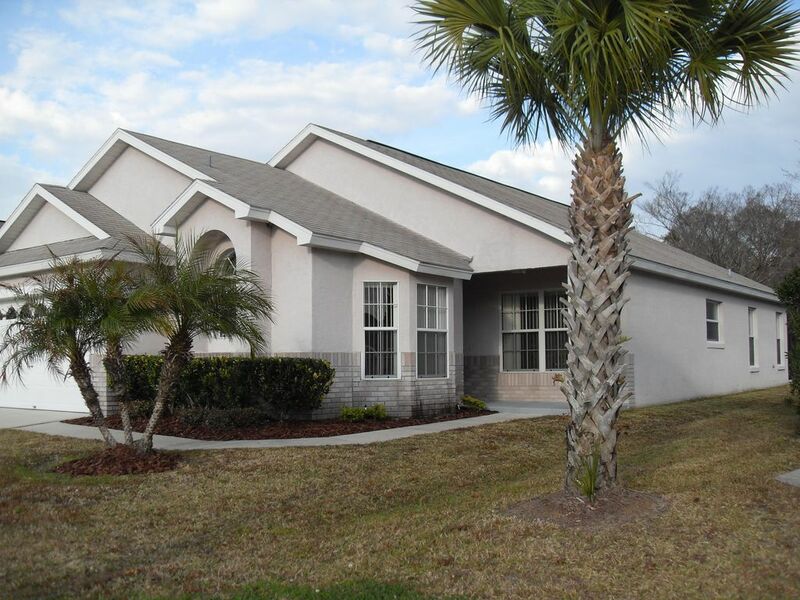 The house is ideally located just 10 minutes away from Disney World and only minutes away from Highway 192 where you will find a wide variety of restaurants, entertainment, and shops. Shortcut to the Super Walmart (2 minutes), come in the back way so don't have to fight any traffic! Sleeps up to ten guests, this home has one king-size bed, one queen-size bed, four twin beds, and one queen-size sleeper sofa in Great Room. All bedrooms are completely furnished and decorated Florida style and include ceiling fans and remote controlled color cable TVs. (one 55' HDTV, one 42' HDTV, one 32' HDTV, two 22' HDTV's.and one 13' TV for VHS tapes.) There are also 3 Blu-Ray Disc DVD Players, DVD player, VHS player, CD player, plus over 60 movies. Relax and enjoy music out by the pool. Very family oriented, so you will find toys, games, pool toys, and books for everyone's enjoyment. Enjoy free 'secure high speed, wireless internet connection' while staying at my home. Free local and long distance phone service. The livingroom is beautifully decorated and overlooks pool area, with comfortable seating that includes couch, love seat, and rocker/recliner chair. There is a 55' HDTV, Blu-Ray DVD player, and stereo system. The master bedroom with king bed has direct access to the pool area and en suite bathroom with double sinks, extra large tub, and a separate shower area. It also has a large walk in closet with hangers for wardrobe and storage. Includes 42' HDTV with Blu-ray DVD player. The Queen bedroom has 32' HDTV with built in Blu-Ray DVD player. The other two bedrooms both have twin beds with 22' flat screen TV's. One includes a built-in DVD player. Your kitchen is complete with all appliances and includes a breakfast area for informal dining. Your home includes a laundry room with full size washer/dryer, iron, and ironing board. Baby furniture (highchair, port-a-crib, strollers) and gas grill are also available for extra charge. Enjoy extra privacy and great view of trees and pond while you relax in your own private screened enclosed pool. Remember, this pool never closes! Covered lanai area so you can be outside even if it is raining. Patio furniture includes tables, chairs, chaise loungers, outside shower and pool towel rack. Convenient pool cover on roller to help keep your pool warm at all times. You will have all the luxuries of home and more, as this is our vacation home too, and we wanted total comfort and enjoyment! For your convenience our management company is available 24 hours. Our home is professionally cleaned and maintained. It is licensed with the State of Florida and Osceola County and is equipped with fire extinguishers, smoke alarms, and emergency lighting. Please No Smoking or Pets Allowed. Two sets of bedding for every room and plenty of towels! Free secure high speed, wireless internet connection. This extra 13' TV is just used for viewing Children's VHS tapes. (5) Over 300 cable channels including showtime and the movie channel. One 55' HDTV, One 42' HDVT, One 32' HDVT, Two 22' DVTV. 3 Blu-Ray DVD Player, 1 DVD player, and 1 VHS player. Has a wildlife conservation area of trees behind home for extra privacy and a peaceful, relaxing view. Even more privacy while relaxing in the pool since I have a white privacy fence on both sides. Perfect for all the parks and Restaurants very well informed from the owner and a lovely clean house with all the mod cons, could not have asked for anything more and would highly recommend this property and owner.